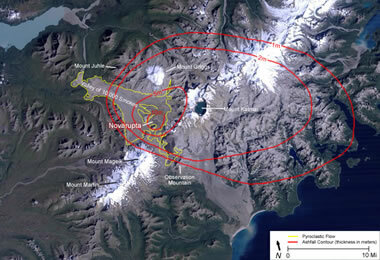 A volcanic hazard that is often underestimated in its geographic reach and impact. 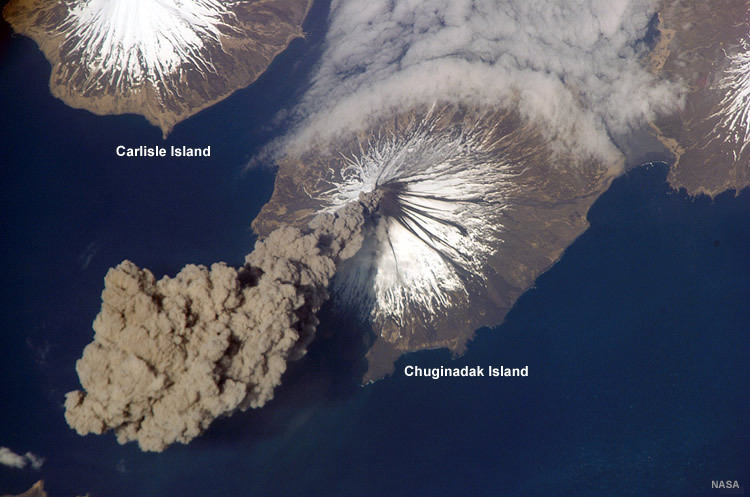 Volcanic ash plume from Cleveland Volcano, located on Chuginadak Island in the Aleutian Island Chain off Alaska. NASA image taken by Jeff Williams, Flight Engineer, from the International Space Station. Larger image. Volcanic ash consists of powder-size to sand-size particles of igneous rock material that have been blown into the air by an erupting volcano. The term is used for the material while it is in the air, after it falls to the ground, and sometimes after it has been lithified into rock. The terms "volcanic dust" and "volcanic ash" are both used for the same material; however, "volcanic dust" is more appropriately used for powder-size material. 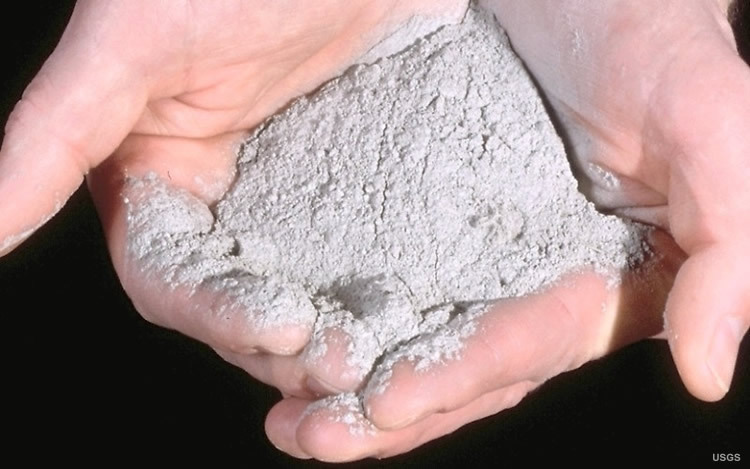 Volcanic ash from Mount St. Helens, 1980 eruption. USGS image, D.E. Wieprecht. Larger image. "Tephra" and "pyroclastics" are general terms used in reference to particles of igneous rock material of various sizes that have been ejected from volcanoes. They are classified by size. The terms "ash" and "dust" communicate a specific size of tephra or pyroclastic particles. These are summarized in the table above. 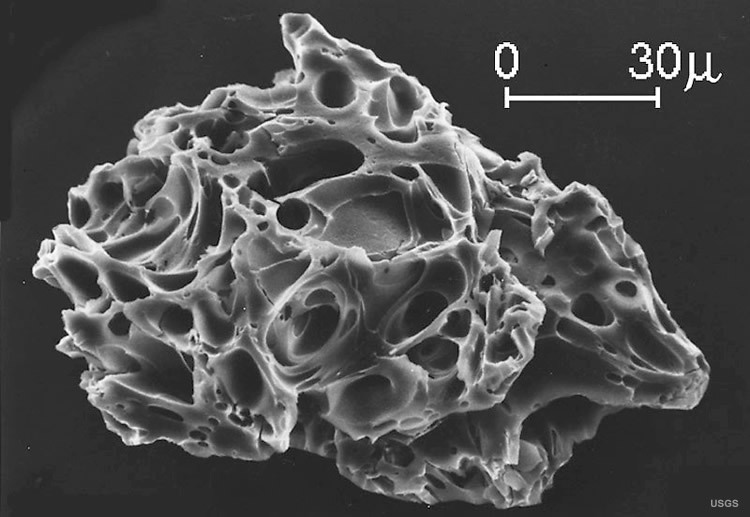 Volcanic ash particle viewed with a scanning electron microscope. USGS image by A.M. Sarna-Wojcicki. Larger image. At first glance, volcanic ash looks like a soft, harmless powder. Instead, volcanic ash is a rock material with a hardness of about 5+ on the Mohs Hardness Scale. It is composed of irregularly-shaped particles with sharp, jagged edges (see microscopic view). Combine the high hardness with the irregular particle shape, and volcanic ash can be an abrasive material. This gives these tiny particles the ability to damage aircraft windows, be an eye irritant, cause unusual wear on moving parts of equipment that they come in contact with, and cause many other problems discussed below in the "Impact of Volcanic Ash" section. Volcanic ash particles are very small in size and have a vesicular structure with numerous cavities. This gives them a relatively low density for a rock material. This low density, combined with the very small particle size, allows volcanic ash to be carried high into the atmosphere by an eruption and carried long distances by the wind. 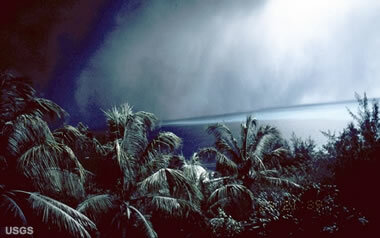 Volcanic ash can cause problems a long distance from the erupting volcano. Volcanic ash particles are insoluble in water. When they become wet, they form a slurry or a mud that can make highways and runways slick. Wet volcanic ash can dry into a solid, concrete-like mass. This enables it to plug storm sewers and stick in the fur of animals that are in the open when ash falls at the same time as rain. Volcanic ash column: Eruption column of Mount St. Helens on May 18, 1980. This explosive release produced a hot column of rising tephra, volcanic gases and entrained air that rose to an altitude of 22 kilometers in less than ten minutes. Strong prevailing winds carried the ash to the east at about 100 kilometers per hour. In less than four hours, ash was falling on the city of Spokane about 400 kilometers away, and two weeks later the eruption cloud had encircled the earth. USGS image by A. Post. Some magmas contain enormous amounts of dissolved gas under very high pressures. When an eruption occurs, the confining pressure on these gases is suddenly released and they expand rapidly, rushing from the volcanic vent and carrying small bits of magma with them. Groundwater near a magma chamber can be flashed into steam with the same result. These are the source of ash particles for some eruptions. 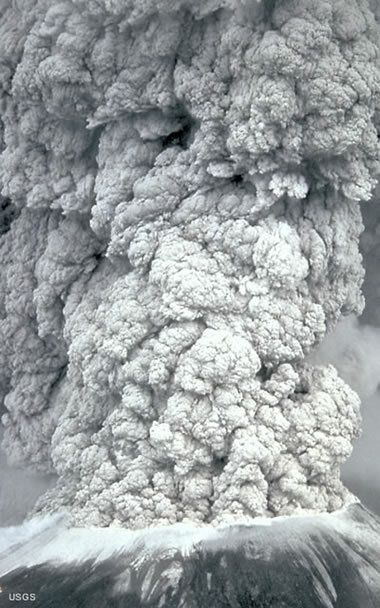 The enormous quantity of hot, escaping, expanding gas rushing from the vent can drive an eruption column of ash and hot gases high into the air. The accompanying image shows a portion of the ash column produced by the May, 1980 eruption of Mount St. Helens. In that eruption, the explosive release of hot volcanic gases into the atmosphere produced a column of rising tephra, volcanic gases and entrained air that rose to an altitude of 22 kilometers in less than ten minutes. Then, strong prevailing winds carried the ash to the east at about 100 kilometers per hour. In less than four hours, ash was falling on the city of Spokane about 400 kilometers away from the vent. Two weeks later dust from the eruption had been carried around the Earth. The Mount St. Helens eruption was exceptional in its size and intensity. A more typical ash release is shown in the image at the top of this page. In that image, Cleveland Volcano, located on Chuginadak Island in the Aleutian Island Chain of Alaska, releases a small ash plume that within minutes detaches from the volcano and is carried away by the wind. Volcanic ashfall map: Map showing the geographic distribution within the United States of ash fallout from the May 18, 1980 eruption of Mount St. Helens. USGS image. Larger map. Ash thickness: Ashfall deposits are generally thick and coarse in particle size near the volcano. However, at distance the deposit gets thinner and finer. 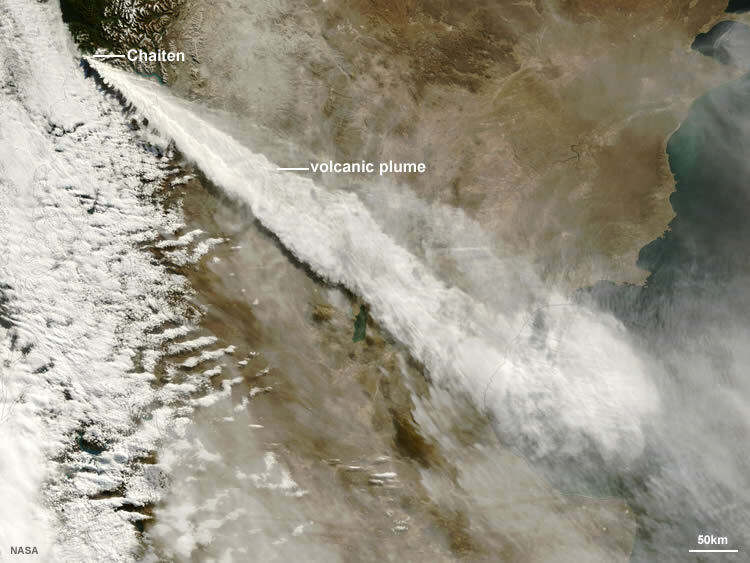 Ash plume: A long plume of ash from Chaitén Volcano in southern Chile is blown across the continent. Larger image. Once ash is released into the air by a volcano, the wind has an opportunity to move it. This movement, along with air turbulence, work to distribute the suspended ash over a broad area. These clouds of ash being moved by the wind are known as ash plumes. An image below shows an ash plume produced by the eruption of Chaitén Volcano in southern Chile on May 3, 2008. This plume begins in Chile, crosses Argentina and extends hundreds of kilometers out over the Atlantic Ocean, spreading out as it travels. As an ash plume moves away from the volcanic vent, it no longer has the rush of escaping gases to support it. The unsupported ash particles begin to fall out. The largest ash particles fall out first and the smaller particles remain suspended longer. This can produce an ashfall deposit on the ground below the ash plume. These ashfall deposits are generally thickest near the vent and thin with distance. A map showing the ash distribution from the May 18, 1980 eruption of Mount St. Helens is shown on this page. 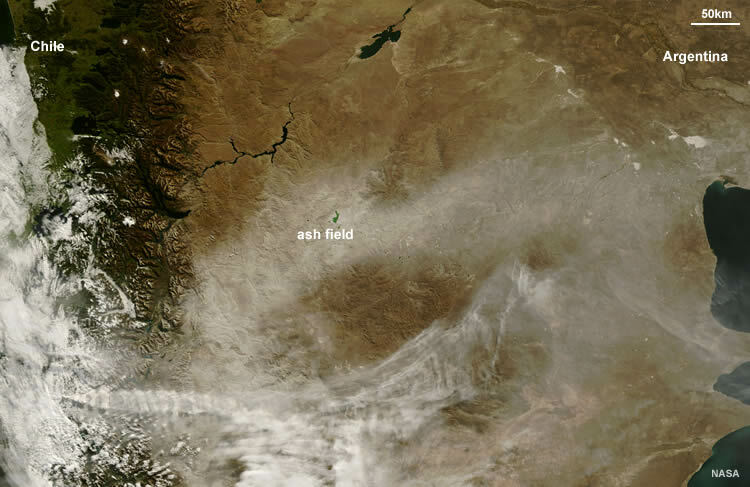 An ash field is a geographic area where the ground has been blanketed by the fallout of an ash plume. An image below shows an ash field east of Chaitén Volcano in southern Chile from May, 2008. The white groundcover of ash can clearly be seen. Ash field: An ash field east of Chaitén Volcano from May, 2008. Larger image. Volcanic ash presents numerous hazards to people, property, machinery, communities and the environment. Several of these are detailed below. People exposed to falling ash or living in the dusty environment after an ash fall can suffer a number of problems. Respiratory problems include nose and throat irritation, coughing, bronchitis-like illness and discomfort while breathing. These can be reduced with the use of high-efficiency dust masks, but exposure to the ash should be avoided if possible. Long-term problems might include the development of a disease known as "silicosis" if the ash has a significant silica content. The U.S. National Institute of Occupational Safety and Health recommends specific types of masks for those exposed to volcanic ash. Anyone who already suffers from problems such as bronchitis, emphysema, or asthma should avoid exposure. Dry volcanic ash can stick to a moist human eye, and the tiny ash particles quickly cause eye irritation. This problem is most severe among people who wear contact lenses. Some skin irritation is reported by people in ashfall areas; however, the number of cases and their severity are low. Novarupta ashfall: Satellite image of the landscape around Novarupta Volcano with ashfall contours and pyroclastic flow area of the 1912 eruption shown as colored lines. Satellite image by J. Allen (NASA) using data from University of Maryland's Global Land Cover Facility. Cartography by B. Cole, Geology.com. Larger image. Livestock suffer the same eye and respiratory problems that were described above for humans. Animals that feed by grazing could become unable to eat if the ash covers their food source. Those who eat from an ash-covered food source often suffer from a number of illnesses. Farmers in ashfall areas may need to provide supplementary feed to their animals, evacuate them, or send them to early slaughter. An ashfall of just a few millimeters usually does not cause severe damage to pastures and crops. However, thicker ash accumulations can damage or kill plants and pasture. Thick accumulations can damage the soil by killing microphytes and blocking the entry of oxygen and water. This can result in a sterile soil condition. Volcanic ashfall damage: Buildings damaged by a wet ashfall. USGS image. Larger image. Volcanic ash: USGS video explaining the impact of volcanic ash on air traffic. Dry ash weighs about ten times the density of fresh snow. 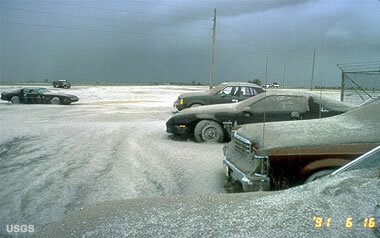 A thick ashfall on the roof of a building can overload it and cause it to collapse (see image). Most buildings are not designed to support this additional weight. Immediately after a heavy ashfall, one of the priority jobs is clearing the ash from the roofs of buildings. If rain falls before the ash is removed, it can be absorbed by the ash and increase the weight. Wet ash can have a density of twenty times that of fresh snow. Volcanic ash can fill the gutters on a building and clog the downspouts. The ash alone can be very heavy, and if it becomes wet from rain, the weight will often pull gutters from houses. Ash in combination with water can be corrosive to metal roofing materials. Wet ash is also a conductor, and when accumulated around the external electrical elements of a building, it can lead to serious injury or damage. Air conditioners and air-handling systems can fail or be damaged if their filters are clogged or their vents are covered by volcanic ash. Moving parts on equipment can be worn rapidly if abrasive ash gets between them. Fine ash and dust can infiltrate into buildings and cause problems with appliances. The abrasive ash can produce unusual wear on the moving parts within electric motors. Vacuum cleaners, furnaces, and computer systems are especially vulnerable because they process lots of air. Darkness due to volcanic ashfall: Ash in the air can block sunlight and make areas beneath an ash plume dark in the middle of the day. Soufriere Hills volcano, image from 1997. USGS image. Larger image. Volcanic ash can have an electrical charge that interferes with radio waves and other broadcasts transmitted through the air. Radio, telephone, and GPS equipment may not be able to send or receive signals with an erupting volcano nearby. The ash can also damage physical facilities such as the wires, towers, buildings and equipment needed to support communications. Volcanic ash can cause a shutdown of power generating facilities. These facilities are sometimes turned off to avoid damage from the ash. They can remain down until the ash has been removed. This protects essential equipment from failure but disrupts power service for millions of people. 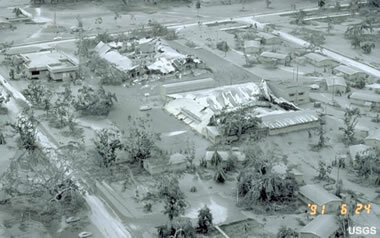 Volcanic ash on cars at Clark Air Base in the Philippines after the 1991 eruption of Mount Pinatubo. This parking lot is about 25 kilometers east of the eruption and received about 9 centimeters of ash. USGS image by R.P. Hoblitt. Larger image. The initial impact upon transportation is a limit on visibility. The ash fills the air and blocks sunlight. It can be as dark as night in the middle of the day. The ash also covers road markings. Just one millimeter of ash can obscure the center and baselines of a highway. Another impact is on cars. They process enormous amounts of air which will contain volcanic dust and ash. This initially gets captured by the air filter, but it can quickly be overwhelmed. Then abrasive dust goes into the engine to damage carefully machined parts and clog tiny openings. Volcanic ash accumulates on the windshields of cars, creating a need to use the wipers. If the wipers are used, the abrasive ash between the windshield and the wipers can scratch the window, sometimes producing a frosted surface that is impossible to see through. Volcanic dust and ash covering the roads can result in a loss of traction. If the roads get wet, the dry ash turns into a very slippery mud. Roads and streets must be shoveled as if a snow that does not melt has fallen. Ashfall layers in the Philippines: A) Section on the Santo Tomas River bridge north of San Narciso, Zambales; 32 km west-southwest of vent. Layer A is 8 mm of sand-sized ash; layer B is 4 mm of mostly fine ash. Note weak normal grading of layer C and scattered coarse clasts on surface of deposit. B) Tephra-fall deposits on unimproved road along the Marella River 10.5 km southwest of vent. 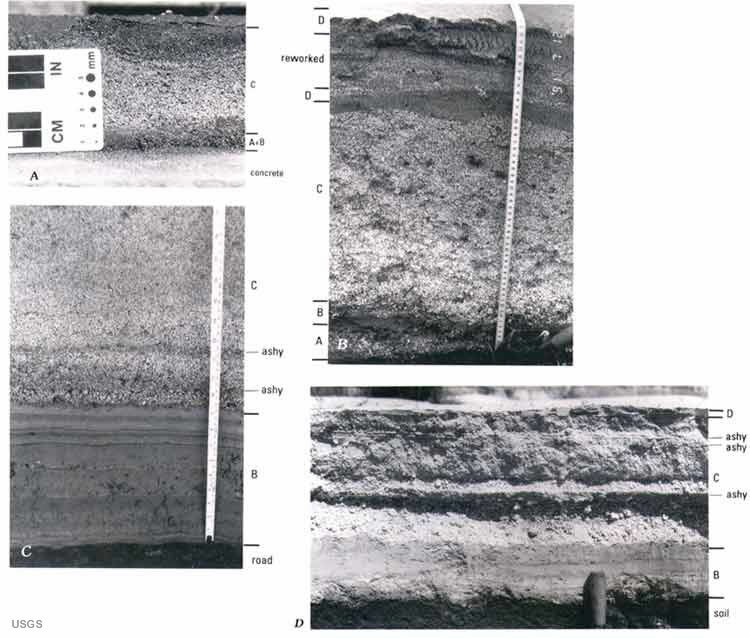 Layer A, about 4 cm thick, consists of coarse ash and fine lapilli; layer B consists of several thin layers of ash; layer C is 33 cm thick and is the thickest section of the climactic pumice-fall deposit yet found. Note normal grading overall, but 2-cm pumice lapillus in upper left. Layer D consists of two 3- to 4-cm-thick beds of fine ash separated by a bed of water-reworked pumiceous ash. C) Tephra deposits on unimproved road about 9 km southeast of vent, north side of Gumain River. Layer B is 23 cm thick and consists of numerous graded ash beds; layer C is 31 cm thick and has two zones in lower part with minor fine ash coatings. D) Section at mouth of Pasig River canyon about 15 km east of vent. Layer B is 10 cm thick and layer C is about 18 cm thick; note ash-rich zones that stand out owing to increased cohesiveness. USGS Images by W.E. Scott and J.J. Major. Larger image. Modern jet engines process enormous amounts of air. They pull air into the front of the engine and exhaust it out the back. If volcanic ash is pulled into a jet engine, it can be heated to temperatures that are higher than the melting temperature of the ash. The ash can melt in the engine, and the soft sticky product can adhere to the inside of the engine. This restricts airflow through the engine and adds weight to the plane. Volcanic ash has led to engine failure on a few planes. Fortunately the pilots were able to land safely with their remaining engines. Today, volcanoes are monitored for signs of eruption, and planes are routed around areas that might contain airborne ash. Volcanic ash suspended in the air can have an abrasive effect on planes flying through it at hundreds of kilometers per hour. At these speeds, ash particles impacting the windshield can sandblast the surface into a frosted finish that obscures the pilot's view. The sandblasting can also remove paint and pit metal on the nose and on the leading edges of wings and navigation equipment. At airports the same problems are encountered with runways as are seen on roads. The markings on runways can be covered with ash. Planes can lose traction upon landing and take-off. And, the ash must be removed before operations return to normal. The International Civil Aviation Organization recognized the need to keep pilots and air traffic controllers informed of volcanic hazards. To do that they worked with government agencies to establish several Volcanic Ash Advisory Centers. 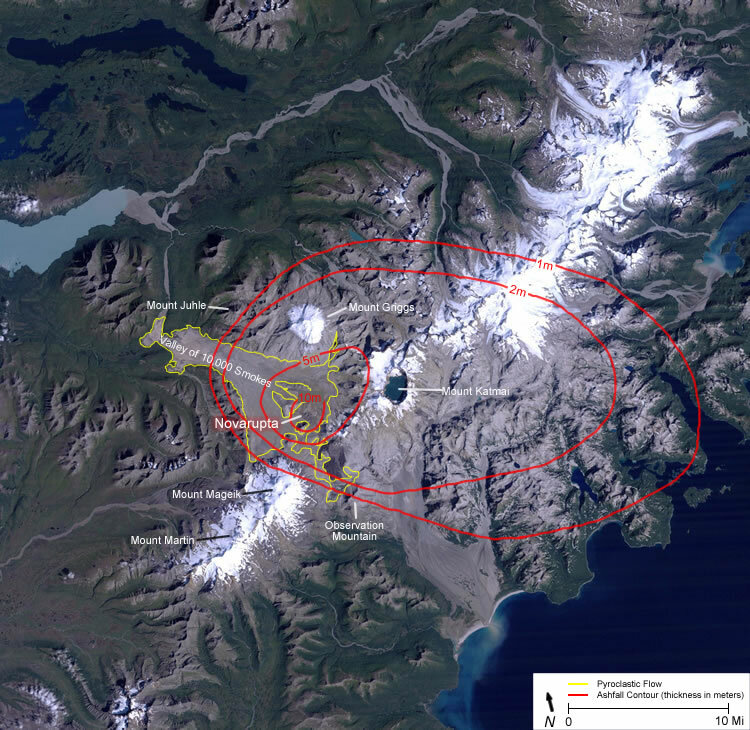 These centers monitor volcanic activity and report on ash plumes within their monitoring area. Water supply systems can be impacted by ashfalls. Where a community utilizes an open water supply such as a river, reservoir or lake, the fallen ash will become a suspended material in the water supply which must be filtered out before use. Processing water with suspended abrasive ash can be damaging to pumps and filtration equipment. The ash can also cause temporary changes in the chemistry of the water. Ash in contact with water can lower the pH and increase the concentration of ions leached from the ash material. These include: Cl, SO4, Na, Ca, K, Mg, F, and many others. Ash falling on city streets will immediately enter the storm sewer system. If ash-laden sewer water is processed, the suspended ash can overload equipment and filters and cause damage to pumps and valves. It also becomes a disposal problem. Mud or slurry of ash can harden into a material similar to concrete. Communities located near or downwind of volcanoes with a potential of producing ash eruptions should consider the potential impact of volcanic ash and plan for ways to deal with it and minimize its impact. It is much easier to become educated about a problem and take action in advance than it is to face an enormous problem without warning.